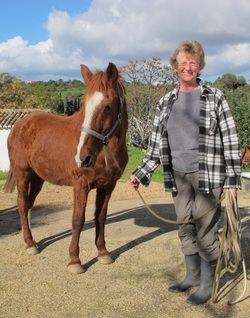 Peta moved to the Algarve 43 years ago with her husband Athol and extended family. They set up home and farm and donated a piece of land for what then became the Pirilampos home for children. For 35 years she helped Santa Casa da Misericórdia de Albufeira, supporting the children by fundraising and other means. In 1995 ‘Amigos das Crianças’ was set up by Peta and the head of the Santa Casa, and monies raised by the Amigos have helped with repairs, improvements, clothing, bedding, dental and optician expenses, and trips and outings for both the Pirilampos young children, and Gaivota teenage children. She also helped with the Casa do Paz, a facility that houses disabled people. Peta also supported animals in need, volunteering for SOS Algarve Animals to rescue and foster dogs, puppies, cats and kittens. As well as fostering, she also carried out emergency rescues, and gave advice and guidance in neglect situations. Peta co-founded and ran ARC Horse Welfare, a community organization to help neglected horses. As part of ARC she worked with horse owners to provide them with food and medication for their horses, reported many incidents of neglect to the authorities, fed and watered starving horses left in fields, and gave advice to members of the public on how to deal with emergency situations of horses in distress. More recently she was involved with Roma communities in Albufeira, assisting families with their healthcare, clothing and other much-needed items, and she had started looking at ways to improve their access to higher education. Peta was involved in a fatal car accident on March 27, 2013. Her funeral was held on April 2 in Boliqueime Church. Read her eulogy in english or portuguese. Please also see some of the news articles written about her at this time. Peta was an irreplaceable member of the community, giving so much time and energy to all the causes she supported, and always with a sense of humor and determination. She is greatly missed by all.